For display purposes, I decided to create a case for the entire stage and ordered a custom 13”W x 8.5”H x 8.5”D acrylic case and used its base as the bottom layer to build on top of, adhering the Lego bricks to it. 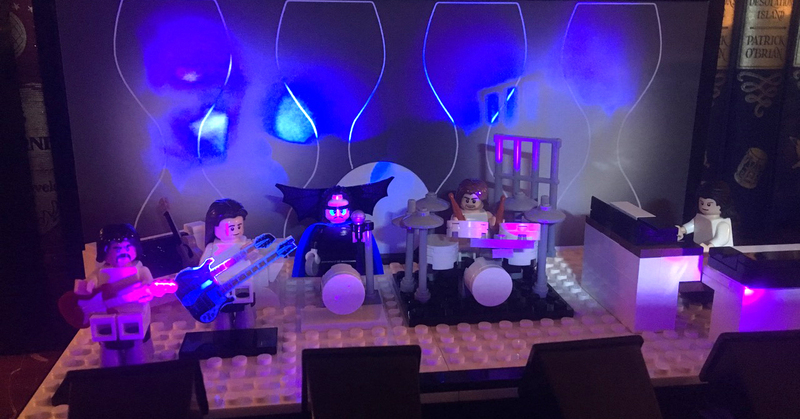 Then, I constructed a base using Legos to create a housing space for the lighting electronics and wiring below the stage. And here’s the final effect, with the lighting properly positioned. You can see the “glow in the dark effect” especially on the white areas of set and Gabriel’s make-up, as well as the purple/blue glow from that performance of “Watcher in the Skies.” Also, the silhouette shadows of the band and Peter’s Watcher wings are a nice touch as well. The whole project was a gift to my wife (huge early Genesis fan) and she uses it as a night light! Next up, I’m widening the stage, adding stage lighting rigs and a few other details, so stay tuned for the evolution in the next iteration!